Active involvement and encouragement from the sponsor, the use of social networking to facilitate communications, a bit of healthy competition and regular team meetings are all critical success factors. Active involvemnt and encouragement from the sponsor can make or break your fundraiser. It's all about creating momentum, showing interest and encouragement, following up, and maintaining active communications with your members. A Facebook page will help sustain the momentum by allowing team members to share their progress, experiences, photos and best practices. Regular check-in meetings will enable the slower starters to get advice, feedback and encouragement from their peers. An effective poster announcing your cause, supported by a well-written and personal statement from you. Good product descriptions. 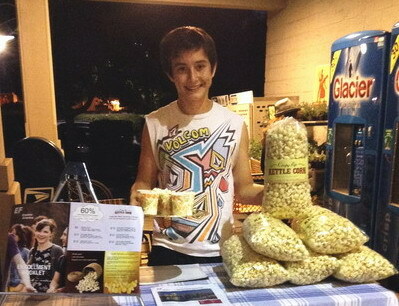 Samples so people can taste how delicious the kettle corn is. A mix of in-person sales and a store-front blitz. Regular ongoing communications between team members. Prizes to the top sellers.